Whether you are in search of a family getaway filled with relaxation or outdoor adventure, you’ll find exactly what you are looking for at these top Maine family resorts. Located within the Northeast’s beautiful landscape, an escape to Maine is filled with Atlantic shorelines, glittering lakefronts, mountain peaks, and rollings hills. And, no matter which resort you choose, you’ll experience quality amenities and comforts that are sure to please. Pack your bags and head east for a vacation of family fun! Linekin Bay Resort is your family sailing resort in Boothbay Harbor. With a variety of accommodation choices, there is the perfect stay for the whole family, no matter how big or small, at Linekin Bay Resort. One to two bedroom cabins feature private baths and front decks overlooking either the bay or secluded in a wooded setting. Lodge rooms offer spacious living and waterfront views. Located in Boothbay Harbor, Linekin Bay Resort has a long list of family fun only steps from the door. As a sailing resort, a favorite activity for everyone in the family is to head out into the bay and flash your sails. Of course, there’s plenty of other water excitement! From kayaking and canoeing to fishing and swimming, there’s something for everyone. Take a day trip to the cliffs of Monhegan Island or check out the Coastal Maine Botanical Gardens. Originally bought in 1909, today's Main Lodge contains the original stairs and fireplace from the two story cottage built by the owners. Come by land or sea to the Waterfront Bar where you can enjoy a delicious meal while enjoying beautiful views of the bay. Experience an unforgettable family vacation at the beautiful Sebasco Harbor Resort. This beautiful Maine destination offers a little of everything you're looking for in a fun and relaxing trip with your loved ones. Stay in one of their luxurious suites or enjoy the extra space of a well-equipped cottage just steps away from the waterfront! Either option provides you with stunning views and access to all of the resort's onsite amenities and activities. Spend quality time with your family as you explore the great outdoors on a canoe or paddle-boat. Or, hit the hiking trails right onsite their 550 acre property and visit sites such as Merritt Mountain and Robinson's Rock. Enjoy an afternoon of family golf at their three-hole course, play a round of volleyball, or head over to the Rec Center for some bowling on their vintage candlepin lanes. Don't forget to join in on their family campfire sing-a-longs and scavenger hunts! No matter what you choose to do, the laid-back atmosphere and endless activities make Sebasco Harbor the ideal spot for reconnecting with your family. Family fun is all around when you stay at Sebasco Harbor Resort. Enjoy games of volleyball or take out a complimentary canoe for a relaxing afternoon on the water. They also offer guided kayaking trips and fishing opportunities from the onsite dock! After a long day, retreat to the onsite Pilot House for a delicious family dinner! You'll love the breathtaking oceanfront views! Experience the thrills of a Maine family adventure at Northern Outdoors. Northern Outdoors has lodging options ranging from campsites and guestrooms to condos and cottages. Their cottages are a great choice for a visiting family with three locations: the convenient Forks Resort, the secluded and tranquil Maine Lakeside Cabins, and the wilderness surrounded Penobscot Outdoor Center. You’ll find modern amenities and comforts to fit your whole family at each stay. Northern Lights is the place for ultimate outdoor family excitement! The Kennebec and Penobscot Rivers are home to the heart-pumping rush of white-water rafting that the whole family will love. When snow covers the ground, the snowmobile trails take you through breathtaking terrain. Everywhere you look is a playground with hiking, golfing, boating, and floating. Make memories that will last a lifetime with Northern Outdoors. If hunting is what you are looking for, make your next hunting trip plans with Northern Outdoors where you'll experience trophy whitetails. Located at The Forks Resort Center, enjoy the unique tastes of the on-site Maine brewery Kennebec River Brewery. Located in the heart of Maine’s Southern coast and tucked into the historic town of Ogunquit, the Meadowmere Resort is one of those rare accommodations that entertains and delights the entire family year-round. The nearby Beaches of York are the center of every summer vacation, while Kennebunkport and Wells antique shops are well within driving distance. Closer to home, Ogunquit’s shops and museums are worthy of a visit – rain or shine. And the Maine Water Park and adventure theme parks are sure to put a smile on everyone’s face. . The Meadowmere Resort has several different lodging options to fit the needs of any size family. Family Suites, located in the South Meadow building, provide space and privacy for a the traveling family. Each family suite features two bedrooms, a private balcony and bath, two televisions, and a number of other modern amenities creating comfort. In addition to a spacious stay, the whole family will enjoy the pools, hot tubs, fitness center, spa, and more! Convenient amenities at The Meadowmere Resort include wireless Internet, heated pool, Jacuzzi, fitness center, spa treatments, smoke-free rooms and cable TV. Creating lasting memories at Point Lookout Resort where the mountainside and Penobscot Bay set a beautiful scene for a vacation filled with family fun. Point Lookout Resort is the ultimate family fun zone with endless activities for everyone to enjoy together. From racquet sports and a bowling center to a gym, soccer field, game room, and playground, the smiles and excitement never end. Cruise across Knights Pond or search for treasure on the private beach for some much needed quality time. Amongst its nearly four miles of hiking trails and scenic landscapes, Point Lookout Resort provides an exciting as well as comfortable stay for the whole family. Their cabins and vacation rentals feature Maine pine interiors and are furnished with quality modern amenities. Enjoy spacious living quarters, fully equipped kitchens, and all the comforts of home with Point Lookout Resort. Point Lookout Resort features a state-of-the-art fitness center, a ten pin bowling alley with arcade, nearly four miles of hiking trails, professional turf soccer fields, and breathtaking views. Point Lookout Resort is home to the Copper Pine Cafe where you'll enjoy hot breakfasts and delicious meals filled with produce grown from Point Lookout's organic farm! Take advantage of the sea and beauty of Maine during your stay at The Dunes on the Waterfront where you and your family will enjoy picturesque scenes and a memorable stay. The Dunes on the Waterfront features one to two bedroom guestrooms as well as multiple room cottages with all the comforts of home and more. Expect outdoor lounging, cozy fireplaces, and a crisp New England style. A stay at The Dunes on the Waterfront puts you near a number of family-friendly attractions that are sure to create lasting memories. York’s Wild Animal Kingdom is a family-oriented zoo and amusement park that is a favorite at any age. For a bit of adventure, head to Monkey Trucks for an afternoon of ziplining, or get some hands on learning at the Children’s Museum. Of course, Ogunquit Beach, right outside the Waterfront, is always the perfect spot for treasured family time. While staying at The Dunes on the Waterfront enjoy a number of added pleasures including wireless internet, a heated outdoor pool overlooking the ocean, direct access to Ogunquit Beach, beautifully landscaped grounds, miles of hiking trails, and dock fishing. 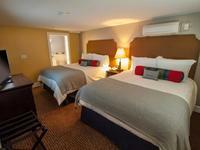 Sheepscot Harbour Village & Resort has a village full of unforgettable lodging options. Choose from charming rooms at the Inn Hotel, spacious suites at the lodge, or private rental cottages on the water. Whatever you choose, your time with the family will be extraordinary. Located on beautiful Davis Island, Sheepscot Harbour Village & Resort is the perfect place to reconnect with your family. The refreshing, laid-back island atmosphere lets you escape the stress of everyday life and focus on the people that matter the most. Their spacious accommodations ensure you have all the room you need to unwind, while the prime location makes it easy to get out and explore. Hop aboard the Ruby Lane for a lobster boat tour down Sheepscot River, head to nearby Boothbay Habor for a day of whale watching or enjoy the waters at the many beaches in the area. You will find yourself just a few steps away from the charming village of Wiscasset, Maine, with shops, antiques, galleries, and whale watching. Onsite you'll find a luxury spa, an indoor heated pool and Jacuzzi, and bike and kayak rentals. The Anchorage Inn and Resort is located in the heart of everyone’s favorite New England vacation destination in York Beach, Maine. Anchorage Inn is just a short drive from Boston and Portland, Maine, making it the perfect place to escape the hustle and bustle of city life. The inn features just over 200 rooms and suites, two outdoor and two indoor swimming pools, a fitness center, and more. Anchorage is located on Long Sands Beach, which offers almost two miles of Maine’s shore for families to enjoy, whether you like swimming in the waves or checking out the tide pools for some sea creatures. Don’t worry about finding food onsite, the inn has the Sun and Surf Restaurant and a poolside café. You and your family will also find plenty to do off-site, with the inn being just minutes from golf, tennis, and all the attractions around York Beach, including the Kittery outlets and the historic York Village. They’re also in view and just down the street from one of America’s most picturesque lighthouses, the famed Nubble Lighthouse. Most rooms at Anchorage have an ocean view. Check out York's Wild Kingdom to experience an amusement park and zoo in one spot, Goldenrod for homemade candy and ice cream, and Fun O'Rama for arcade games. Experience an outdoor family adventure in the Great North Woods on the shores of Moosehead Lake at The Birches. No matter what time of year you prefer to enjoy, The Birches provides the ideal outdoor experience. Winter brings snow filled excursions of exploring the countryside by snowshoes, skis, or snowmobile. The summer sun is a great time to enjoy the lake with canoeing, kayaking, fishing, and swimming. Of course, hiking and biking are always great ways to see the sights and share some laughs. Whether you are planning an intimate family escape or a family reunion, The Birches has accommodations to ensure absolute comfort. Their rustic lakeside cabins range from one to three bedrooms, providing a cozy and quaint atmosphere. Larger and private, their homes and cottages easily accommodate larger groups, and the lodge rooms feature balcony lake views and that “at home” feel. Originally built in the 1930's, The Birches began as a hunting and fishing lodge in the Great North Woods. Comfortable and casual, The Birches Lounge offers three hearty and delicious meals where the stone fireplace is always roaring and every table has a lake view. Most families are looking for a wide assortment of activities to enjoy while on vacation, and The Nonantum Resort is happy to be of service. This Kennebunkport resort offers something for all ages and can suit groups large and small, making it the ideal destination for your Maine family getaway! Whether your family's pleasure is enjoying a day on the water with a kayak adventure and a stand-up paddle board excursion, or taking a dip in the outdoor heated swimming pool, there is something for everyone at The Nonantum Resort. The anglers in your family can charter a deep sea fishing trip on the Libreti Rose, or the whole family can hop on a sailing cruise aboard the Pineapple Ketch! Kids' Corner Crafts offers the little tykes a chance to exercise their creativity while on vacation, and the Family Campfire Sing-A-Long and Marshmallow Roast is a timeless favorite. Plus,the onsite restaurant, 95 Ocean at The Nonantum Resort, offers a kid's menu that will satisfy even the pickiest of eaters. Don't waste another minute! Start planning your dream family vacation in Maine today! The Nonantum delivers one of the finest Maine resort experiences. This seasonal resort is open from mid-April to mid-December. The collective history of the resort and its guests is a remarkable tale of hospitality and enjoyment. The friendly staff looks forward to having you as their guest. Traditions begin here. Your children will love the resort's Kids' Corner Crafts, Follow Me Kayaking Excursions, Family Move Nights Under the Stars, Kids' Ice Cream Parties, Princess & Pirate Parties, Family Campfire Sing-A-Long's with Marshmallow Roast, and so much more! Maine's Great Diamond Island is a stupendous backdrop for any number of activities, and those activities are best experienced at the Inn at Diamond Cove! The Inn at Diamond Cove was constructed during the 1890's, back when Fort McKinley was part of the country's coastal defense system to protect Portland's Harbor and Casco Bay. That sense of history purveys every aspect of the Inn, exterior and interior. Your family will get around on the island on golf carts and bicycles, ideal for exploration and fun! Whichever of the 44 deluxe guest rooms and suites you stay in, you'll enjoy lavish amenities and a spectacular view from your private balcony! All suites feature a fireplace, parlor and a separate dining room. The Inn features an outdoor pool with a Cabana bar! Grab the kids and head to Eastport, where the sun shines bright and the air is so dewy sweet you can practically taste it. It's there you'll find Rossport Lodging & Retreat, truly a slice of heaven on Earth. The Rossport area is the perfect place to take a cottage holiday with you family! Each of the 12 privately located sites have easy access to 80-plus beautiful acres of countryside, spectacular ocean views, and majestic native flora and fauna. There's also 1.5 mile of pristine shoreline, where your family will have a blast swimming, relaxing, and simply enjoying the oft-beautiful weather. After a long day of fun, pull up an Adirondack chair, kick off your shoes, and settle in on your porch for a beautiful sunset! Check out the incredible fresh seafood the fishing boats bring into Eastport each day (only 2 miles down the road). The lodge was founded in 1987.